While I find the enclosure useful, it is a bit awkward to use (taking the printer out to change tools), and not as functional as I’d like. I’ve seen a few mods on here with people adding lights etc., so thought I’d share my fairly extensive modification. For the major mod I wanted to add lights, a fan to extract fumes and separate power switches for everything. I decided to replace the top and rear panels with plywood to mount everything to. 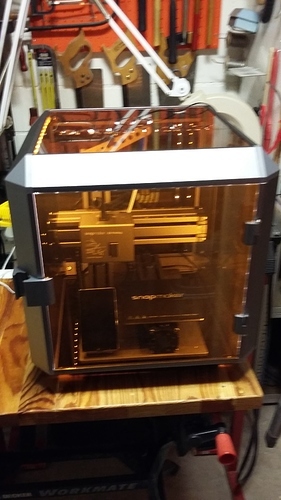 The plan was to have connectors outside the case for power and USB, with internal extensions to connect to the printer. 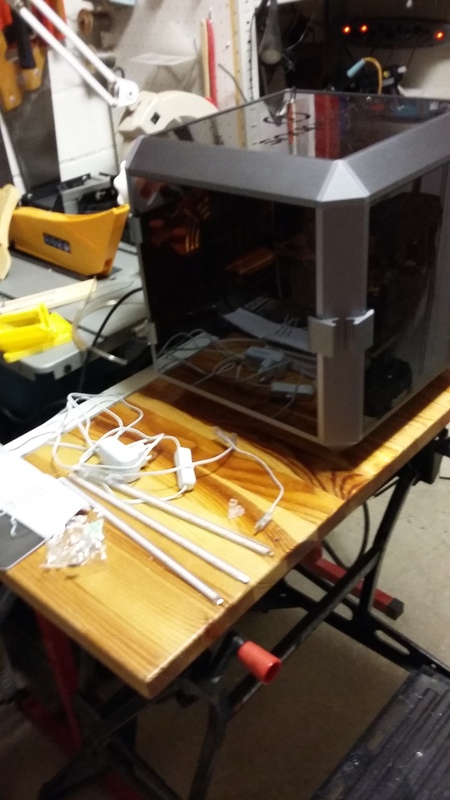 I also wanted to have the filament feed though the top directly into the printer, rather than hang on the back and have to go through two 90 degree direction changes (I never had any issues when printing, but the feed didn’t look like it was as smooth as it could be). 3mm ply wood is slightly to thick to fit so I had to trim down the edges with a router. I cut all the holes for the positions of everything, then stuck some white card on the inside, and silver on the outside. I bought a 12v step down regulator (that doesn’t get hot! The first one I tried seemed like it would set fire to the card…). The rear power connection is wired to the master switch (missile style, also functions as emergency shutdown), which then splits the 24v supply to the printer switch and the 12v regulator. The 12v regulator output is then connected to the power switches for the LED strips and fan. LED strips are left over from a previous project, and the fan is a 12v computer cooling fan. The power connectors I bought from the local electronics store, 2.1mm DC connectors. Switches are pretty standard sort from any electronics type place, except the style I liked were rated for 125v AC, and could light up, but the light was a small neon globe that only worked with about 90v AC (according to my research). Since I wanted stuff to light up, I took the switch apart and replaced the neon bulb & resistor combination with a 3mm LED & resistor combination (different resistor for 12v versus 24v switches). I designed a filter holder in Fusion 360 to fit a filter cartridge form a respirator face mask (like you use when spray painting) so the fan would have a filter. Not sure if the fan has enough flow/power to get air through the filter, so this may need changing later. In the two shots above you can just see the old 12v regulator in the first one, and the new one in the second (hidden at the back behind the switches). The first one got so hot after about an hour (even with a heatsink) it overheated the capacitor next to it, which then blew. New one doesn’t get warm after many hours. I also looked for a spool holder, but didn’t see one that would fit well, so I designed one in Fusion 360. The wheels are spare parts for sliding doors found at the local hardware store. Wheels are designed to have variable width to fit different spools. It appears to all have printed smaller than I designed it, which I have found others commenting on, so will go back and have another go. Really liked the switches and the new filament feeding path! My concern to remove the bottom panel is for the eventual light cnc mess… I should print one of the fences/walls for that though. Very nice! I like how you put a slot in for feeding the filament… allows for the lateral pull as it unwinds. Good thinking. How do your cats feel about it? Added LED strips to the Enclosure last night. Couldn’t use the connectors supplied so had to do a bit of soldering.